We can easily forget that there are writers capable of creating fairy tales equal to Grimm. 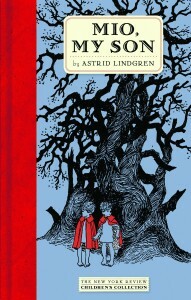 Astrid Lindgren is one such author. (In fact, her books, written in Swedish, are the fourth most translated after Grimm!) Her children’s book Pippi Longstocking, is famous in its own way, but her others, such as Ronia, The Robber’s Daugher, really showcase her skill in creating timeless fantasy for children. This children’s book, Mio, is a full-fledged fantasy tale from beginning to end, with good and evil, fear and courage, and of course, a wonderful ending. The story involves a young boy who is the son of the king of Faraway Land, returning to his father with a mission to face an evil force in the kingdom. The interesting thing about fantasy is that when you know its fantasy from the start, the ‘scary’ parts are not as scary. And the heroic parts are very heroic. This story has wonderful models of loyalty, courage, and willingness to sacrifice for others. There is no shortage of morals, as well as an abundance of reverence to the natural world. The language is a tiny bit stiff, but I do believe that is because it is a translation of the original. You can sense wonderfully lyrical passages here and there that are priceless. I don’t know what to say about the audience. I think that the 8 to 10-year-olds will do well with it. It could easily be a classroom story read by a teacher each day. In our Waldorf classrooms, this occurs during snack, and I could see this being read to a 4th grade class, maybe 3rd grade.